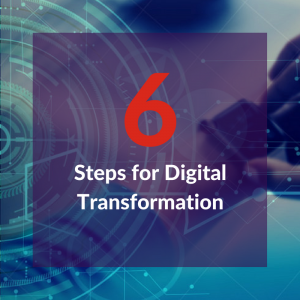 ERP: 6 Steps for Digital Transformation. Digital transformation is one of the more recent buzzwords created by the business technology industry. As with all the rhetoric that surrounds the discussions into the benefits of updating business systems and how new functionality offerings can revolutionise business operations, it can be easy to get lost in the myriad of technical jargon that surrounds these topics. This is why when we were asked to provide independent and impartial workshops for The Manufacturer Connect event in June we wanted to help drill down to the fundamentals of how digital transformation projects are actually delivered successfully. In the workshop we discussed how the principles and the steps required do not require technical knowledge, they do however, require a full understanding of how your business operates and what areas of of your organisation require improvement in order to achieve your business’ targets. This small downloadable guide taken from the workshops is now available for you and will give you the basic steps to follow to be able to start your digital transformation project. We will be running more workshops at the next Connect event on October 5th and hope to see you there.